Coming up on Saturday, August 3rd my magic team and I will be heading down to Chicago for the TCG Platinum $5,000 Cash Event. We’ve been doing a lot of preparation, and at least two of us will be playing Mono Red, so I wanted to talk about some of the lists I’ve been testing and what ideas are coming from that process. Both of these lists are of the “Big Red” variety heralded by Valeriy Shunkov and Andrew Shrout, which I’m starting to like more and more. Both players also played the exact same sixty card maindeck, which focuses on removing early threats or burning to the face if the opponent doesn’t have any, followed up by huge plays in game 1 Burning Earth and Thundermaw Hellkite. Considering that the meta is largely Jund, UWR, and Aristocrats, this strategy is pretty great at stealing a game 1 with an almost unbeatable card if your opponent isn’t prepared. Now that the strategy is in the wild, they might be packing a few extra singletons to deal with it, but I could easily see a lot of Jund players just ignoring this deck and believing that it’s “fringe”. The maindeck has some strange choices, Hellrider being quite awkward without a supporting cast, but he’s still 4 damage on an empty board and a threat that requires an answer from your opponent. The deck’s curve is also a bit odd, with a huge chunk of it stuck at 3 and 4 mana. I don’t mind this so much, as you have a lot of burn, but I think the deck is a bit shy on early burn and lacking of draw power to keep consistent. Shunkov mentioned that he thought Chandra would help the latter, and I think having some early creatures or extra burn would help the former. Both players lists above try to address this with their sideboards. Leforest mostly ignores aggro with a misers blasphemous act which he was also bringing in against Jund at the GP (to combo with Reckoner), while Herrera goes “whole-hog” by including Rolling Temblor, Mortars, Shock and Ratchet Bomb. It’s clear that the two players were focusing on beating different decks. Supposedly Herrera lost twice to Jund (but played it six times), and Leforest lost twice in the swiss although what he lost to wasn’t published. Leforest ultimately lost in the top 8 to UWR, but from the match report it sounds like he was mostly land screwed. He won game 1 with a Burning Earth, and got stuck on 3 the last two games. G/R Aggro has to be addressed. The best cards against them in my opinion are Mizzium Mortars, Rolling Temblor, and Volcanic Strength in that order. Mortars kills every one of their creatures and acts as Searing Spears 5-8. It’s fine against any Aristocrat deck at just killing a two-drop, and it can overload for extreme value in this deck. Rolling Temblor risks missing some guys like Flinthoof, can penalize you if they have a Reckoner out, and misses Lingering Souls, but otherwise it’s almost always at least a 2-for-1 if not something crazy like a 5-for-1. Volcanic Strength on any guy in your deck is basically unbeatable, it’s just a matter of whether or not you’ll be in a favorable board position to use it. It’s certainly better games 2 and 3 than Burning Earth against aggro. B/W Tokens / Aristocrats is a very tough deck that is resilient to sweepers, so that needs attention too. I like Ratchet Bomb for this, although I don’t know what number. Electrickery is also nice as a 5th or 6th Bonfire. The biggest problem is you can’t just play a sweeper and win against this deck. You need to have X number of one and two drop burn spells to back it up. Since these Big Red decks run 25 lands a lot of times you’ll flood and the games can be high variance. I believe something needs to be done to address that issue along with having a better game against aggro. Despite the 60 card maindeck being dedicated to beating Jund, UWR, and possibly Naya, the games still aren’t a shoe-in by any means. Leforest has Curse of the Pierced Heart, Mark of Mutiny, Skullcrack, and Wild Ricochet, while Herrera has Possibility Storm. Personally, I like Mark of Mutiny and Skullcrack against Jund, and Curse / Ricochet against UWR, although I prefer Traitorous Blood to Mark. 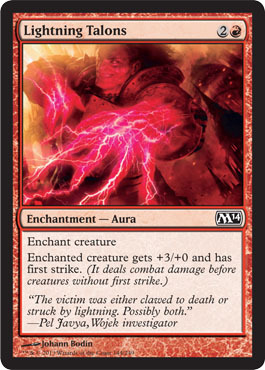 The 1 point of damage is not nearly as significant as the trample, and too many players value those “situations” where you need to play a burn spell alongside of your threaten effect. Trample is SO important in a lot more board states than the extra damage is. 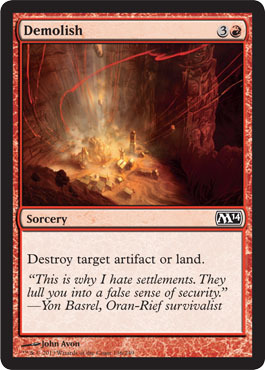 Skullcrack is not a card that many players like bringing in heavily against Jund, however I think it is fairly good here because it acts like Burning Earth 5, 6, 7. Essentially you just want to see one of those cards hit the table prior to their Thragtusk or Sphinx’s Revelation, because most of the time that should be enough to swing a close match. Curse of the Pierced Heart is often laughed at, but this card was huge on MTGO in Red Deck Wins sideboards and is a great clock against decks that don’t do anything for their first few turns, especially when backed up in the later game by heavy burn and sweepers. If they can’t kill you, they will be getting killed for sure by this card. Other ideas I’ve had are Archwing Dragon (possibly just better than Hellrider despite the presence of Lingering Souls), and Ash Zealot who I think is fine at anypoint in the game as a hasty attacker or an efficient blocker not to mention giving you some added pressure against decks like Junk Rites and Aristocrats with Lingering Souls. Young Pyromancer also might be a consideration for this deck just to provide blockers and another must kill threat, but I’m not sure. He does lower the curve a bit, which is something I think this deck is screaming to have done. 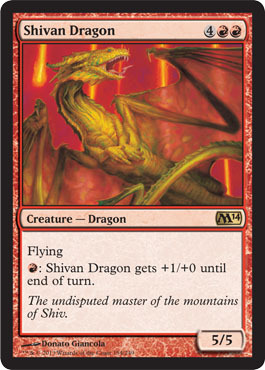 Sullivan is the master of all things Red, and his current list packs a lot of firepower. For a more in-depth deck tech, I’ve included his video on my site here. His list aims to blitz them like previous iterations, but I like that he’s included extra burn to make sure that his guys punch through as well as cutting the three-drop slot to maximize his early damage. The one fallacy in my mind, and something he alludes to in the deck tech, is that this deck looks very soft to control and potentially struggles against a good Jund hand. Even after sideboard, the deck is fragile. It doesn’t have the resilient creatures that the Aristocrat decks do, and other than Mutavault, it really gets hosed by a Supreme Verdict or Bonfire. That said, it’s incredibly fast with 12 one drops, and it can turn on Battalion pretty easily thanks again in part from Mutavault. He splits Mark of Mutiny and Burning Earth in the board, largely as he said due to Burning Earth not being great once the board position has developed, and I completely understand this logic. In a blitzy deck, you can’t afford to play too many four drops, and it’s very rare that a Hellrider is something you want to take out of your 60. Still, I think I’d want at least three Burning Earth, as the card is just too good most of the time against the decks that are hurt by it. Legion Loyalist is a nice substitute for the Denizen against tokens, but I think I still would want some number of Electrickery. Drew’s list is very interesting. He has a similar plan to Sullivan, except he substitutes Flunkies for Young Pyromancer, which in my opinion is fine either way. Flunkies gives you some pressure against decks that are expecting to Pillar and Bonfire away all your early drops, whereas Pyromancer demands an answer before he gets out of control. Levin also adds Dynacharge and Krenko’s Command to truly flood the board and add an even bigger “nut draw” to this archetype’s potential. I could just see some openers where you roll out one drop into Burning-Tree into Krenko’s Command, into Dynacharge and just completely blow out your opponent. I think any red player would smile seeing something like this. But where Sullivan’s list has some suicidal tendencies, Levin’s list suffers from them even more. Young Pyromancer and his team of minions are hit hard by Bonfire / Verdict, and Dynacharge is often a terrible draw late if you get behind. This list is so close to a block deck, and I think Drew’s experience there is actually hampering him as sometimes the extra standard cards you have access to can help you push through against decks with extremely powerful mid games. I like to have some gas in the tank left when playing against Jund, because sometimes they’ll just turn 3 Huntmaster into turn four Thragtusk, and I don’t like those games to be completely unwinnable. I do like his sideboard better than Sullivan’s though, as he has just about every card needed to address what’s currently popular in the metagame. In fact, his sideboard is practically perfect in my eyes, so I’d keep that in mind when designing the next build of red at home. I currently have two lists that I’m testing independently of the ones above (all of which I’m still focused on). For the 5K I believe my list will be very close to the Big Red mold, but I’m trying a couple things out just to make sure I’m not missing some value. What this list aims to change over the more popular Big Red builds is the presentation of a clock. While having smaller creatures is a risk against a field that has heavy removal, part of the strength of a more traditional aggro deck is that they put pressure on your opponent. Their biggest issue is finishing the job if your opponent is able to stabilize. This list presents the best of both worlds. A high majority of the time in testing this list comes out the gate just like a normal Mono Red Aggro deck. BUT, it has enough lands that it can support big Bonfires and Thundermaws, which help you get past roadblocks and win games that you otherwise don’t belong in. So far I really like this list in testing, it’s been very strong with only a few games where it stumbled due to mana trouble or not enough burn. You certainly trade off some things by going with less burn, no Reckoner, and one less land, but I think you gain serious ground by making your opponent have to do something proactive during the first three turns. I’m going to be testing my list again heavily tonight, so look to my twitter feed this week for updates. 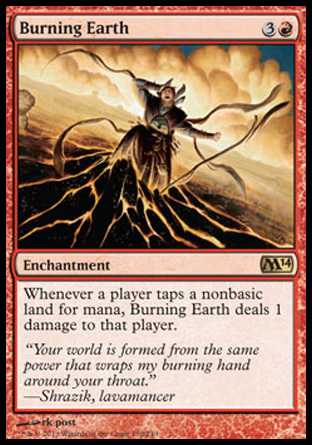 If I could change anything at the moment, it might be to move Burning Earth to the main and add a few more sweepers and threaten effects to the board. But that’s undecided at the moment. This is 70 of the 75 cards that Sullivan played, but basically I just wanted to get an extra Burning Earth in the board and some extra game against control. First I must recommend reading Travis Woo’s original article on the deck, which can be found here. There are good ideas on game play in there as well as other possible cards to use. I however stand by my iteration of the deck. It works well for me. I like how it plays and it is competitive. You need to enable your filter cards. Just about anything is keepable if you can get Izzet Charm and Faithless Looting online in the first 2-3 turns. If you can get Breaking // Entering online turn two, it is worth considering keeping particularly if you have more than two lands in hand. Because then it is likely that you will be able to flashback a Faithless Looting in the yard followed by a turn four Unburial Rites. Don’t keep hands that have no filtering. These hands are slow and will lead to losing turn 4-5 versus anything faster than you. Filter as quick as possible dropping stuff into the yard. Ideally you are looking for the possible turn four Omniscience into Sphinx into Angel loop play. Just as good, however, is nerfing your opponent’s first four turns with a turn four Angel of Serenity or an Elderscale Wurm. Those are hard to fight through and require removal. Obviously Angel works better at nerfing the opponent’s plays so that is the best target. Being able to ignore all attacks however is not a bad play either and just may save your game. Beyond turns 4-5 look to hold onto cards in your hand a little more. Sure still play lands if it makes sense to play them, but you never know when you might need to dig for something and holding that extra land in your hand may make the difference between winning and losing as you need to be able to pitch something to Izzet Charm and Faithless Looting to keep your best card. Aim to stabilize first, combo second unless the opportunity presents itself. Consider yourself a Reanimator deck with potential to combo out. My meta is aggro heavy, not control heavy, the way most metas seem to be lately and you will lose often turn 5-6. Turn four for some decks. This is why there are 7 maindeck creature answers to recur against aggro; Griselbrand counts to a lesser extent as an opponent has more tricks and options with his creatures on the board and it is possible that you won’t gain life or the life you gain won’t be enough. You will likely find at least one of them with all the filtering. Dinrova Horror and Archaeomancer are there to both help enable the combo and to win on the spot once you’ve got the combo up. For instance Dinrova can bounce your own Angel or Sphinx of Uthuun to keep the gas up. Once the combo is up, it bounces everything they have and makes them discard a bunch. They don’t recover from this. You can almost leisurely finish them off after that. Archaeomancer is a more immediate win with the combo up. If you don’t have the combo, Archaeomancer can recur an Obzedat’s Aid out of the yard that you may have binned with Breaking. 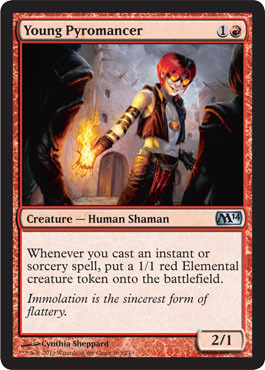 And you certainly could reanimate Archaeomancer to get Obzedat’s Aid into Omniscience if you have the turns / mana. Mostly though I end up using it as a way to get back Breaking to continue finding the cards I want. Once you have the Omniscience Angel Loop, splicing this guy in there means you can get any instant or sorcery out of your yard which means you can get Breaking and Entering many times. So if you wanted to, you could: mill out your opponent taking all of their creatures out of their deck with Breaking // Entering as well as mill yourself taking all of your own creatures out of your deck, followed by bouncing everything they have with the Horror, followed by playing every permanent in your grave straight into play with Obzedat’s Aid, followed by placing every single instant and sorcery in your grave into your hand, followed by swinging in with ALL the hasty creatures from both your decks, followed by SAY WHAT? HE JUST SURVIVED VIA FOG, no matter, pass the turn… win via decking. For any deck that will kill you turn 4-5-6, I bring in most of the board. Your goal is no longer to play for an Omniscience, but to slow them down just long enough to land Angel, Wurm, or Griselbrand. Anything and everything that doesn’t contribute to surviving I chop. I take out Omniscience, I take out Horror, Sphinxes and Archaemancer. We are no longer hunting for Omniscience so I take out Obzedat’s Aid (we still have 8 pieces of recursion, but less creatures to find) and if I need even more I will trim a Lantern and 1-2 Faithless Looting. This is 13 cards swapped. Obviously bring in only what is needed, but this is where I look for space. I bring in Pillars for anything with quick or recurring 1 drops (Young Wolf, Doomed Traveler, Red Deck) and possibly even for Mana Elf creatures. Syncopate from turn 2 and on is gold. I bring it in to mainly nerf a turn 2 play. Ral Zarek I consider bringing in as he carries two Searing Spears and likely buys a turn if your opponent swings into him. He can also act as acceleration for your 7 drops as well as a way to clear the path for one of your beasts. Oblivion Ring is also something to possibly bring in as more removal. Cyclonic Rift likely won’t be overloaded here so it is not really a good option as bouncing a guy is not what you are looking to do. Anything that will take longer to kill you is likely Control, in which case I for sure bring in Ral Zarek, probably Syncopates and depending on the grave hate they show as well as the planeswalkers, Oblivion Ring and Cyclonic rift. I look to trim Faithless Looting first and Chromatic Lanterns second to find space. You will have time to find lands, and you will still be able to pitch things via Izzet Charm. If a deck is playing it, sure it nerfs a part of your deck. You can still play your monsters normally with Chromatic Lantern. Most of the grave hate will come down on turn 2 or later with the exception of Tormod’s Crypt. If they play Tormod’s Crypt, you need to be smart about how you feed your grave and get them to Crypt things that aren’t as relevant. If they play Ground Seal, Rest in Peace, or Scavenging Ooze, Izzet Charm takes care of them in the main deck. With the board you have many more options, but ideally they don’t make it into play or last longer than a turn with the answers you have in Syncopate, Oblivion Ring, Cyclonic rift etc. Ground Seal is not as much of a problem with Breaking // Entering as that recursion spell in particular does not target the monsters. Similarly with Scavenging Ooze and a couple of mana open, you could still rip a monster out of a yard depending on how many are in there. There are other grave hate cards – Cremate and Purify the Grave in particular, that can beat you, but you pretty much just have to play through them. Entering is very useful in those situations in particular. There are new things that have changed the landscape a bit, I do believe this is still a viable deck despite them. I have not however tested it versus any newer iterations of decks. From what I hear Jund is the top dog more or less with main deck Scavenging Oozes and Junk Reanimator has fallen off the radar a bit. Not necessarily a bad thing for this deck as that means less hate in the sideboard plans and a bit less preparation for a true Reanimator deck. As long as you plan to see Scavenging Ooze, there should be a plan for it. The manabase; it’s four colors… with a fifth being accessible with Lantern. You want to have a turn one red source, followed by turn two having BOTH blue and black available. This lets you cast all of your filter cards which will let you further fix your mana. You also need on turn 4 or 5 at least one white source for Obzedat’s Aid and Unburial Rites. On top of all that you shouldn’t kill yourself with your own shock lands so some amount of tap lands makes sense. I’m not sure my manabase fully accomplishes this task, but I think it comes close. The sideboard could certainly could use fine tuning. I’m pretty certain the only necessary cards are the Syncopates and a couple of Oblivion Rings. I really wish Pillar could be something else like Terminus, but it may just be a necessity to slowing down certain matchups. I could see Snapcasters in the mix too as well as more counter magic, but I’m not certain that is what the board needs. Terminus, Detention Sphere and Supreme Verdict as well as more white toys…I don’t believe we are white enough for them to really be useful exactly when they are needed. To accommodate them I believe we would have to completely rethink and retool the deck which certainly is a possibility. My version has a few quite notable differences from Travis Woo’s list that shored up some key matchups. This huge wurm crawls out of the graveyard on turn 4 or 5 and makes aggro players throw fits. What do they do? It nullifies attacking and locks my life total against most decks. So I played 3 main over things like Borborygmos and Tyrant of Discord. Second, I played Breaking // Entering over Forbidden Alchemy – This card was key in setting up a consistent turn four Angel of Serenity or Elderscale Wurm. If I had a Rites or Wurm / Angel in hand, Izzet Charm and Faithless Looting were enough. Often though I found that I was missing either the Unburial Rites or the big creature in hand to make that work out. Milling myself eight cards meant I got to see a solid chunk of the deck which more often than not allowed me to find the four Rites to get to a turn four reanimation. Plus it acts as reanimation spell 8-11 and also gives your giant creature haste. This allowed me to steal a game or two that the opponnent thought he had locked up. With an Angel and another dude or two in play, their army vanishes and yours crush on through. You can also rip something out of their yard if yours is a little empty. Third, I cut one Omniscience, one Obzedat’s Aid (hence only 11 reanimation spells), turned the one remaining Tyrant into a Dinrova Horror and added one Archaeomancer. This put the focus more on reanimation with the possible oops I win via Omniscience which still happened often enough to warrant play. 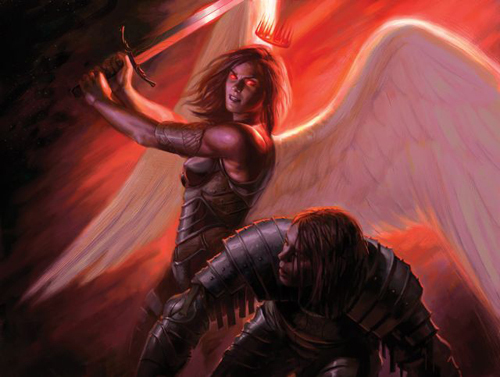 The Dinrova Horror acts like an Angel in the sequence of free Omniscience Angels; a way to bounce a Sphinx to play it again as well as a way to bounce all of your opponnents permanents. It’s targeted where the Tyrant of Discord is not. Tyrant of Discord may accidentally hit more, but it cannot target what you need to get rid of. Archaeomancer enables an immediate win via Breaking // Entering and the free Omniscience / Angel loop. Fourth, and MOST important… I HAD A SIDEBOARD PLAN. This is probably the most crucial thing I did to shore up the aggro matches. I can’t say my sideboard was perfect but it definitely won me games by just having a plan. When there was a blitzy deck that I was playing against I dropped the Omniscience package and sided just about my entire side board to slow them down just enough to get out an Elderscale Wurm or an Angel. Moving onto the matches. . .
Game 1 he had main deck Cremates for my turn 4 Omniscience. Luckily for me he had no solid answer to my turn five Griselbrand which netted me life, drew me some cards and was joined by two Angel of Serenity. It’s nice when Angels and Demons work together. Game 2 Appetite for Brains stole an important card from my hand and I didn’t recover from his Desecration Demons. Game 3 he hit both of his Cremates and an Appetite for Brains. Thoroughly wrecked my hand that game. Game 1 I choose to mill him with Breaking to see if I can get rid of one of his win conditions – by far his quickest win con. I’m not sure I even saw what the other win cons were. I’m pretty sure I actually cast Omniscience in this game. Then combo’d for the win. Game 2 I believe I sided out a couple of Faithless Lootings and I think a Wurm for some Ral Zareks as this was going to be a slow match where Ral could just take over. I was for sure right on that one. Ral Zarek went ultimate, I flipped coins, then proceeded to play a second Ral Zarek and start taking my extra four turns. He cast Slaughter Games calling my Breaking // Entering, but it didn’t matter. I found an Omniscience, combo’d off and played another creature to attack with. I had I think two extra turns left and an Obzedat’s Aid in hand which really made me wonder, how many extra turns could I take? Game 1 he’d never seen this deck before and I managed to get a relatively quick Omniscience; I think turn 6 or so. I did just enough of the combo for him to realize the Angel loop and the win condition. Game 2 He had lots and lots of countermagic for me to contend with and I just could not overcome it. Game 3 I found some of my own countermagic. Managed to go to one life, stick a Wurm go to seven life, lose the Wurm to Selesnya Charm, go to four life, and then stick another Wurm. Unfortunately time then got called and we ended with a draw. So 1-1-1 in games not great, but not bad. Relatively small crowd and an opportunity to turn it around. Game 1 I was mana screwed after a mull to six and lost pretty quick. I couldn’t find a white source for the Unburial Rites which made all the difference. Game 2 I bring in the sideboard I created for quick aggro and dropped the Omniscience package. I proceeded to burn, counter and destroy all of his creatures and let the Wurms and Angels play cleanup. Game 3 more of the same. Big stuff out of the yard, remove all other threats. Game 1 John got an extremely good start curving perfectly as that deck does. I Izzet Charm’d his two drop which bought me at least a turn. He used his burn, to my face. Then I believe on my turn five I managed to find a Wurm, drop both Unburial Rites and Wurm into the yard via Faithless Looting and recur the Wurm to take over. I believe I was at three or four life before that. Game 2 I board in some removal and counters for the Omniscience package, manage to stick the Wurm and then lose to a Traitorous Blood. Game 3 on the play I decided boarding in Ral Zarek would help with the creatures. I’d get to turn 4 and be able to play one to pick off a guy. The removal helped me survive quite a while. I managed to stick an Angel of Serenity and then stick a Wurm. He had double Traitorous Blood on five land and me sitting on an Izzet Charm. The wording on Wurm as well as how intense the tournament was (John was asked to speed up play) resulted in a big misplay that may or may not have swung the game in his favor. He stole the Angel and then realized the Wurm would still keep me alive even though the Angel could attack past the Wurm. He meant to take the Wurm and swing into my Angel. 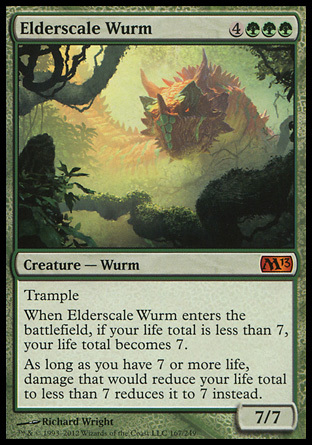 Thus putting me at less than seven life which would have meant the Wurm would no longer protect my life total. That would have given him I think 2 guys back on his side of the board which may have made the difference. On my following turn I had an Izzet Charm and a land. I kept the land in hand and swung with both my Wurm and my Angel which was also a misplay. I should only have gone in with the Wurm. Next turn he Traitorous Blooded my Wurm again with two land open. I mentally smack myself as Izzet Charm does nothing. Then I decided to draw with it on the off chance that I would hit a Syncopate. I got so incredibly lucky. Syncopate for four which stunned John. He didn’t believe I’d brought that in. That put me in Top 8, 3-1-1 in the Swiss. I know what he has, he knows what I have. Game 1 he hits double Cremate again (the only two in his deck) and I lose. Game 2 I board out the Omniscience combo as it wasn’t likely that I’d get to it and Appetite for Brains was a real threat. I board in Ral Zarek which manages to take a swing from a Desecration Demon which kept the pressure off of me and allowed me the opportunity to get an Angel out onto the board. I had Wurm in play but it didn’t matter as he doesn’t prevent life loss, just damage, so Geralf’s Messenger’s effect could still get through. He did however tap out for a Demon. I manage to play Breaking // Entering to fetch an Angel and finish it up. I managed to hit Angels and Wurms and Oblivion Rings for his creatures. I kept bouncing his life gain dudes and Demons and Disciple of Bolas. I get him to eight by Breaking // Entering in an Angel to remove all his dudes and swing in. He rips a Mutilate to wipe my board and starts recovering life. I stick Griselbrand. He sticks Demon. Move to my turn. Pre-combat I chose to draw cards with Griselbrand, and set my hand down. I start drawing in twos, 2-4-6 but for whatever reason I kept going… 8-10 cards…… I can’t believe I did that right in front of a judge watching the match. We spent probably the next half an hour hunting down rules trying to figure out if there was anything that would save me from this horrendous misplay. It would have sucked bad as I was about to pull back out ahead. I was about to accept the game loss when John, thank god, noticed the one card that was separate from the 10 card pile. I had set my hand down apart from the mess that I drew. That alone kept it from a game loss as I hadn’t technically drawn the card yet and turned it to a warning. Three cards got put back on top and shuffled and I continued in a shaky and an incredibly careful way, making sure I only drew 1 card at a time from then on. Oblivion Ring out of that seven cards got rid of his Demon and allowed me to swing in with Griselbrand. Another Mutilate and we had no creatures on board. He kept drawing cards and drawing cards from then on, and I realized it was only a matter of staying alive long enough to find Breaking to finish it up. He was a very good sport and a very good player. It would have sucked to go out with a game loss but at least I’d give the game to a decent person. The last round I lost horribly to a fast Gruul Aggro deck. Game 1 was hardly a match. I died because I couldn’t find a white source or many creatures to recur. Game 2 I stumbled on lands hitting multiple comes-into-play-tapped lands which resulted in a turn too late Unburial Rites with an Angel in the yard. Had the deck not stumbled I would have had a turn four Angel. Great tourney overall and awesomely fun deck to play. It’s been a while since I’ve posted and I want to get back to my readers here on how testing and tournament play has been going. Since my last article I’ve joined a local Magic team that has formed to try and get someone qualified for a Pro Tour or in the top 8 of a large cash event. I’ve also had some pretty interesting revelations about the new format that are absolutely worth talking about. For starters, I came to a significant realization. Standard has changed. Red Deck must change. I did some heavy testing against this list last night and saw elements of it in tournament play at our local win-a-box. It’s incredibly resilient, taking many of the great lines of play from Junk Aristocrats that were so tough to beat, but adding Xathrid Necromancer to the fold which is just a straight beating if left unchecked. This list I think is even stronger than Junk Aristocrats because it plays the full playset of Lingering Souls and Gather the Townsfolk which allow the deck to create a large army quickly. This helps them with both blocking, Blood Artist triggers, and simply getting your life total down faster. 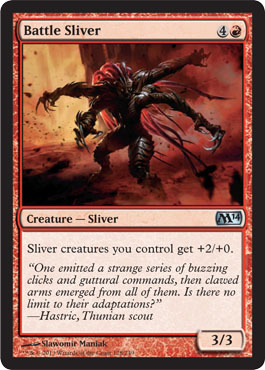 The miser Orzhov Charm is something that is actually pretty strong, not only does it up their removal count but it gives them outs to stuff like Hellrider so that his triggers can’t push through for those last lethal points. What I think is probably the weakest point of the deck is the lands, which seem to be inconsistent, and the fact that the sideboard isn’t really geared towards beating aggro (they just expect to beat aggro and thus only have a few cards to bring in like Doom Blade, Profit // Loss, and Brave the Elements). While I’m not wild about taking away some of the speed, all of the Blood Artist decks struggle when you have heavy removal for their creatures backed up by cards that go over the top of them. Sweepers in particular are great, which is why Jund has had so much success everytime they cast a Bonfire. 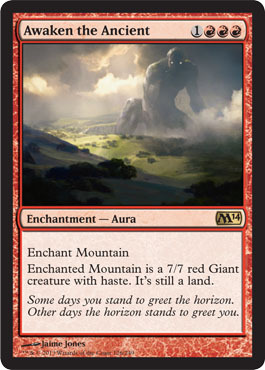 Well upping the land count to accommodate for more Thundermaws and the Bonfires allow this to be a possibility for red, and it takes the deck in the direction of simply playing control. The game plan is to kill as many of their creatures as you can, and then let Chandra’s Phoenix, Hellrider, and Thundermaw finish the job. My only issue is that I may even need a smidge more in the way of Electrickery, Rolling Temblor, etc, and I’d still like to improve my game 1 which will probably require some maindeck changes. One benefit of this sideboard plan other than the cards you bring in is that you blank a lot of their removal and lines of play since they’re expecting you to have dozens of little creatures yet most of them are taken out. Tragic Slip becomes far less powerful, often forcing them to use multiple cards to take out a single one of your guys. Basically you’re again taking out the Tragic Slip and Pillar of Flame targets and replacing them with bigger hitters. 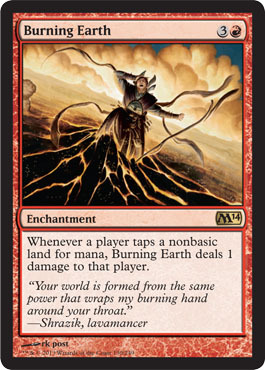 Burning Earth on turn 4 is almost always game over if they didn’t sideboard in removal for it. Jund just simply can’t play through this spell. I was playing against Bant last night at the tournament and it was the same story. Thragtusk gets almost completely invalidated, and they’re almost always low enough in life that casting any spell either kills them or puts them into the lethal column for your creatures and burn. That all said, the plan might want to stay towards keeping the deck fast and just bringing in Burning Earth. While Thundermaw can be a complete house against Jund, if they have removal it’s a big sink of mana and sometimes they just get overrun by your opening draws if you keep the deck streamlined. Mutavault is really great in this matchup, as most of their removal is sorcery speed or conditionally can’t hit him, so he tends to slip under the radar and get in a few of those needed points of damage. I’ve been incredibly impressed with Mutavault thus far, he was great back in his day in aggro decks, and he seems to have a perfect home here. He gives the deck a lot more reach, not just from wrath effects, but also in the way that he gives you additional attackers to punch in the last few points of damage and avoid flooding out. Another card I’ve been trying out again is Skullcrack, I was playing them last night in my list but I’m not sure it’s the effect I want. 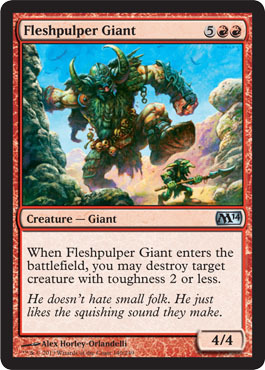 I’ve never been impressed with the card, it always looked plausible on paper and a lot of builds have it, but the biggest problem is that it’s a terrible draw after they’ve already landed something like a Thragtusk. 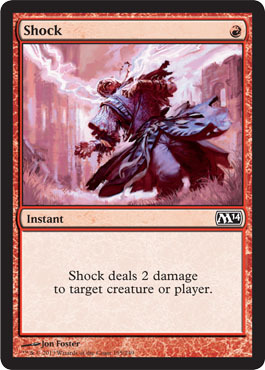 A card like Traitorous Blood is always live, and always liable to deal about as much damage back to them as they gained not to mention the ability to swing combat math. It also randomly gets you out of games where you have a higher losing percentage, such as against decks like G/B Rock. That was my only loss of our local win-a-box weekly tournament last night, and it was pretty much because I had no answer to Desecration Demon. I’ve played against this deck online and it’s a pretty tough matchup, although the versions with Imposing Sovereign and Fiendslayer Paladin are significantly more uphill battles than the one you see above. Your plan is much the same as it was against opposing aggro decks prior to M14, and that is to burn everything in site and then let your guys do the mop-up work. This is a matchup, along with Gruul and Red mirrors, that might demand having Mizzium Mortars back in the sideboard. I haven’t tested it with my recent build, and that might be something I need to revisit. Currently, 10 burn spells is still a good number, and Bonfire is absolutely a card I want out of the board, but the gameplan here is yet undetermined until my list is more streamlined. I’m not sure if this deck really improved or not. It certainly placed well at the SCG, although it failed to crack top 8 which means that the top players with Jund and Aggro were prepared for it. I’ve played against versions very close to this online post-M14, and Mono Red is still faster then them most of the time. The addition of Chandra’s Phoenix also lets you fly over the top or chump block Spectral Flight, which can be huge. Curiosity also does nothing against you for the most part other than slow them down by wasting a card. Unflinching Courage is still the nasty bearer of bad news, and if they stick one you’re typically in a lot of trouble. You need to combat them with speed, but having Bonfire and some additional mana to play it can completely destroy them. I’ve seen several people cut pillar in this matchup, but being able to kill fencing ace, pilgrim, and sideboarded smiters (with blocks), is extremely important to winning this matchup, not to mention just having a one-mana burn spell to give you additional reach. I don’t think you need to go the full 24 lands for bonfire here, but it’s possible I’m wrong. You certainly don’t want to flood too hard in this matchup and Mutavault doesn’t do a whole lot other than possibly get in the way of an unsuited-up Geist of Saint Traft. Another worry from their side of the table is their ability to sideboard in Fog, so it’s possible that we again might need Skullcrack. It’s good against their Unflinching Courages too. I’ll be honest, this is probably the toughest matchup for Mono Red, or at least one of the ones that is almost unwinnable. I played against the pre-M14 version a lot in person and I’ve played against the new version online, and their deck is chock-full of cards that just crush opposing aggro. The elves they play can be burned, but once an Archdruid sticks, times are tough. Predator Ooze is basically unkillable, so you’re only hope is to sideboard cards like Traitorous Blood and hope to steal one that has grown too large for it’s own good, or fly around it with Thundermaw Hellkite and Chandra’s Phoenix. The new Garruk is absurd if he lands in time, and Thragtusk out of the board spells more trouble. Revenge of the Hunted is game over against just about every deck if it’s miracled, and the list goes on and on. Bottom line, this is one of those decks you hope doesn’t get popular or one that you hope to dodge. The one saving grace is that you are faster than they are, so sometimes if you get a strong hand you can run them over before they get online, or if you get a suite of your fliers. 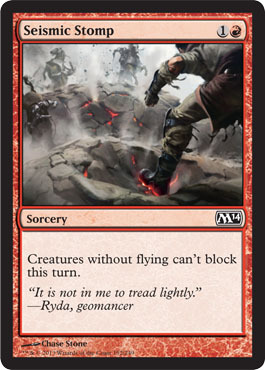 You’re basically turning into a burn deck here, riding on the back of your removal and fliers. It’s possible you still want Hellrider, but typically his damage isn’t going to be a nail in the coffin. I’m still working on the UWR Flash and Gruul matchups, the board will probably adjust for the latter. Mutavault and Chandra’s Phoenix add a lot of value to the UWR match. I actually like this card, at least from an abilities standpoint. 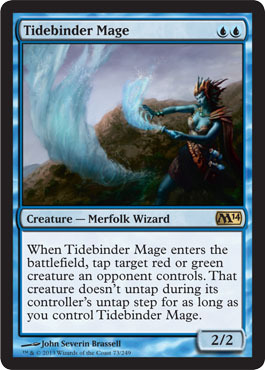 I ultimately don’t think it will see play because unlike Pyreheart Wolf which has such a game-warping effect, Academy Raider is more of a Merfolk Looter which is something that isn’t really needed even though it’s a rare ability to see in red. 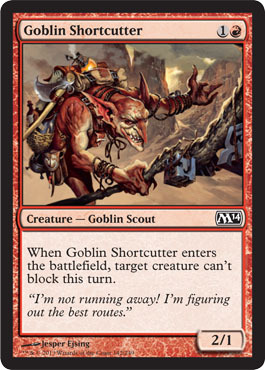 Rummaging Goblin is the closest card I can compare it to and he did not see any play in constructed formats. 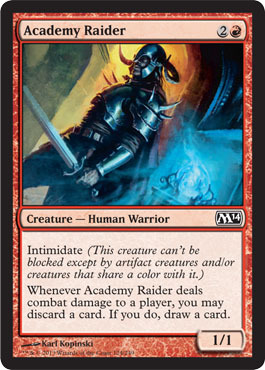 The fact that Academy Raider is a human might give him a bit more leg room in the current format, but again I don’t want to say too many positives here as I just don’t think he’s playable. If he had cost RR instead of 2R he probably would see some action, but at 3cc his cost is simply too prohibitive. 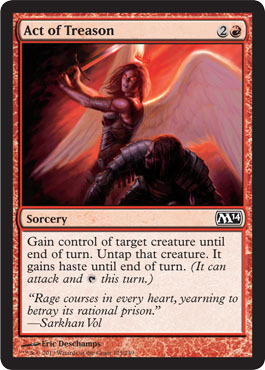 Act of Treason has been used in Red Deck Wins several times throughout its history, and while it’s probably one of the worst threaten effects, it might need to be used once Traitorous Blood and Mark of Mutiny rotate. Traitorous Instinct will still be around, but the four mana cost can be a large issue in a deck that doesn’t want anything expensive. This most likely will be the go-to if Theros doesn’t print a better option. That said, I’ve almost never seen a base set that doesn’t have a threaten effect so time will tell. 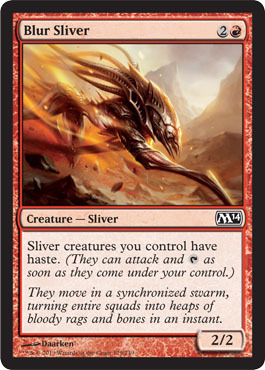 If there is a slivers deck, Blur Sliver will be in it. Giving haste to your team of creatures with ridiculous abilities is a must, especially when this guy exists. 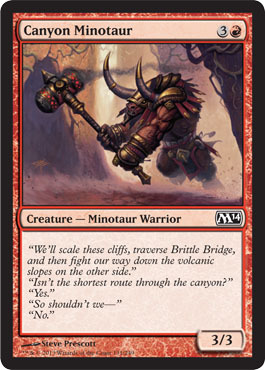 Canyon Minotaur has always been a solid beater in draft in a color that just wants to pump out dudes, so he’s likely to be a role player again in that format. Otherwise, he’s one of the most vanilla and unexciting cards in this entire print run and of course will see no constructed play. 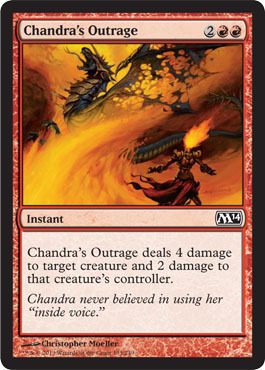 I really wanted Chandra’s Outrage to be playable the last time around, and even tested it for a while, but it always came down to it being too expensive. At three mana, this thing would be insane and a must-play in RDW, especially being that it’s an instant. But at four mana, it competes with way too many cards and doesn’t offer you enough value. 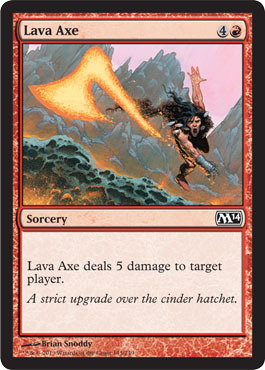 I don’t need a mini Lava Axe tied to my Flame Slash, and if I do it better cost less mana. We live in a world of Supreme Verdicts, Thragtusks, and Angel of Serenitys, which mean you need to get down to business. Let’s be honest, this guy is not blocking 90% of the time so the latter part of his text means nothing. What does matter is he’s a 3/4 for a high casting cost with conditional evasion. NEXT. 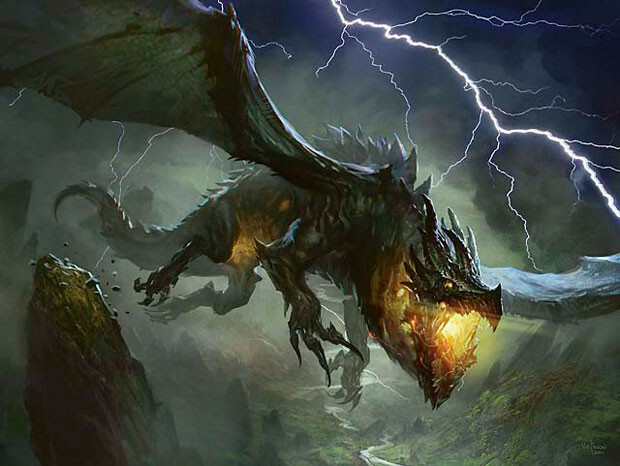 While he didn’t see much play before outside of the occasional draft deck, Dragon Hatchling might this time around if a Dragons deck comes together. He enables Scourge of Valkas to do some serious damage, and his firebreathing ability is always wanted on a creature with evasion. Most likely scenario is that there isn’t a Dragons deck and that he sits in a box, but I never rule out the outside possibilities of bright minds like those who play Magic. Outside of draft decks and some kind of future goblins deck, I can’t see this being played. Firefist Striker is just better and already sees a ton of play in Red archetypes. If his ability had some kind of buyback to it he’d be a lot more considerable. The only (and again very remote) possibility of him seeing some action would be due to the existence of Burning-Tree Emissary, but there’s a lot of other two drops that come first in the line of considerables to combo with that card. Everyone knows about Lava Axe so I won’t go into much detail here. Now I leave it up to you to manage that draft deck where you get 7 of them. . .
It’s 90% unlikely to see play in constructed simply because it doesn’t offer evasion and there happens to be better enchantments available at the moment like Madcap Skills, but otherwise this has always been a fantastic draft card that often sleeps until later picks. In Shards Draft this card was the real deal and I used it many times to completely take over combat. It falls to the same fallacies as other enchantments though, and that means you have to keep the cautious eye out for the possibility of getting 2-for-1’d. Three mana is also too high these days for something of this effect outside of draft, if it were two mana it would probably be lurking on MTGO somewhere. Again another solid option for draft, and a downright dirty one if you get Advocate of the Beast and are building G/R Aggro. A 5/3 for 4 is a good rate to beginwith in draft, and the always attacking clause is relatively unimportant since you’ll be doing that anyway and this guy will often be the biggest thing on the board alongside an army of little guys. He won’t see constructed play, but a four mana common usually doesn’t. Maybe playable in sealed if you’re limited on guys, otherwise I’ve never been a fan. He’s overcosted and the effect is unreliable to trigger, both things you don’t want when spending five mana on an underpowered roadblock. Wizards just keeps printing worse and worse Ball Lightnings. Four power is a lot though on a three mana cost guy, so I could see him being played in hyper-aggressive draft decks with lots of removal, but outside of that he won’t see any other kind of play. 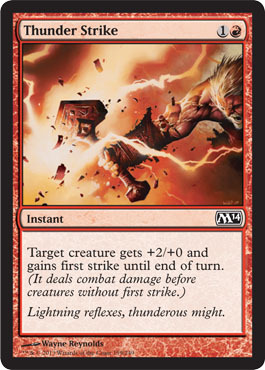 Ah, the undercosted and underplayed Lightning Bolt. Shock might see a bit more play this time around given the current state of burn in Standard, but with Voice of Resurgence requiring Pillar of Flame and other options that highly contest it, I don’t think Shock will be too high on anyone’s list. It’ll really come down to whether you need the instant speed or not, as the damage output is just too low for most builds. In draft however, this is of course a very high pick, and post-rotation it might be necessary in Standard. 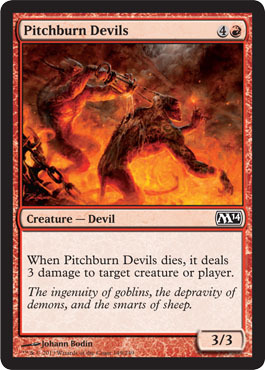 Other than maybe fringe play in Eternal formats (which I doubt), I can’t see this card being played. It’s an OK draft sideboard, but even in the days of Scars block you know that you’d rather play something with more value. Its efficiency is the only thing it has going for it and it’s often a dead card in an aggressive deck. Give me my Ancient Grudge please. One of the best slivers in the set in my opinion, and he should see play if that archetype exists. First Strike is always great to have, and when your whole team has it, times can get very annoying for your opponent. 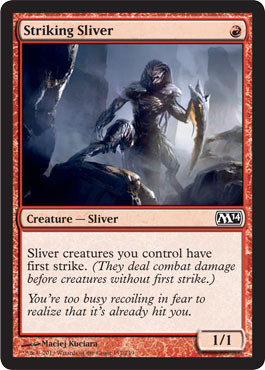 The only drawback is that by himself he’s not hugely impressive, but Boros Recruit did see some minor play when he was around so you never know. This is a solid instant that unfortunately isn’t a burn spell. That means it’s a conditional 1 for 1 and outside of having some long-winded reason for needing it in a draft deck it’s unlikely this card will be played. 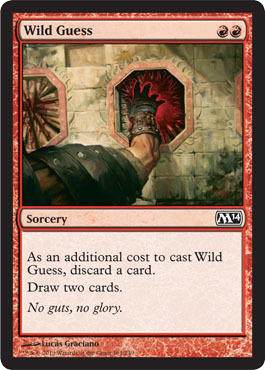 Anyone want to help me and take a wild guess as to why Wizards keeps printing this card? 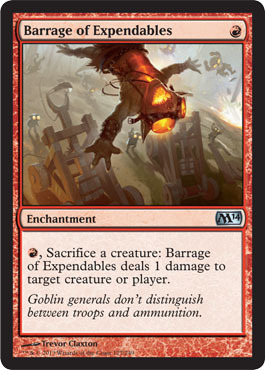 We start with a combo card right off the bat, in the vein of the classic Goblin Bombardment. There’s so many places you could begin with this card that it’s hard to gauge where it will ultimately end up, but I’d be surprised if it didn’t see play. 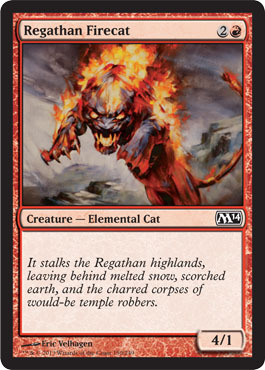 For starters, some of the possibilities that come to mind; Manaweft Sliver (if there is a sliver deck) to make all of your creatures tap to sacrifice themselves for 1 damage, Young Pyromancer to funnel a token army into a giant Fling party, and finally red has a card that allows you to fling that fatty Thragtusk you just stole with Traitorous Blood to add even more value and get your very own Beast token. I imagine there could be some scary combo deck built around Young Pyromancer, Burn at the Stake, Barrage of Expendables, and Battle Hymn. I’ve seen some prototype lists online while testing and they were not quite ready for primetime but they had some frightening options that came to fruition in a few games. Lastly, the Aristocrats deck just seems to be begging to have this. While they already have a number of sac outlets, this one in combination with Blood Artist makes for some brutally quick games. It’s really difficult to figure out how good these slivers are going to be. Each one of them is slightly overcosted for their P/T ratio, largely due to how insane they can be as a team. 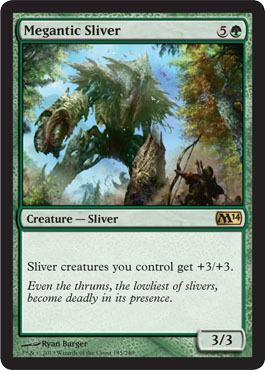 This to me appears to be another staple, although I like Thorncaster Sliver a lot more since his damage is almost guaranteed to get through. Still, this card is no joke, often just being a psuedo overrun, and a lot of times in red that’s just what the doctor ordered. Like I mentioned in the previous part of this article I don’t see a real chance for a Mono Red slivers deck, but if there was one this guy is most likely a part of it. 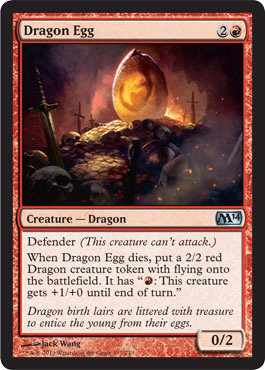 Yet another card to support a dragon theme and another throwback (see: Rukh Egg). Maybe this will see play in some sort of control deck as a chump blocker that turns into an evasive threat or another chump blocker, but I’m skeptical. None of the other eggs saw widespread adoption, although they were certainly popular with the casual crowd. 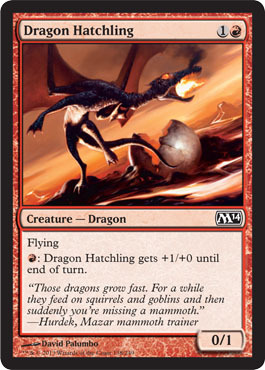 One outside chance this might have is in an actual “Big Red” dragons deck, where it functions as an early roadbump on the way to heavy hitters. It combos very well with Scourge of Valkas, so it’s not completely outside the realm of reality. 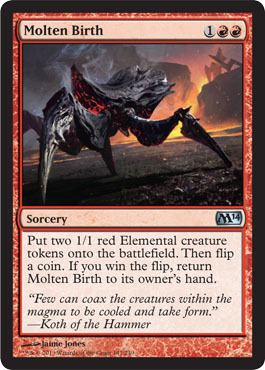 This is used right now in Mono Red, and given the lack of other solid burn spells in M14 and the ones leaving come rotation, I expect this to be used even more if anything. Glad they reprinted it although I really wish that Arc Trail could have come back instead. 7 mana for a 4/4 that kills an inconsequential guy? Child, Please. I have yet to see any coin-flip cards make the cut in tournament played decks (although I’m probably forgetting one or two), and I haven’t heard any rumblings online except for people wanting to Snapcaster Mage this card. Thus, it’s likely going to sit in a box and collect dust. I think it’s borderline playable if you can make some kind of combo with it, Young Pyromancer again coming to mind. 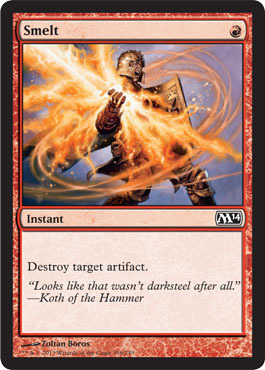 In fact, with Young Pyromancer this card is actually pretty potent even if you don’t hit the buyback on it, but that’s two cards together and by itself it’s less than impressive at it’s mana cost. This reprint has seen some play in a few formats before so it’s not completely ruled out as a Standard playable. I think it’s going to be too high in casting cost and too fragile to be able to use, but you never know. There’s simply a lot of competition at 4cc and usually you’re not in the market to make your grizzly bear fly at this point in the game. It’s great in EDH though with a general like Uril, the Miststalker. 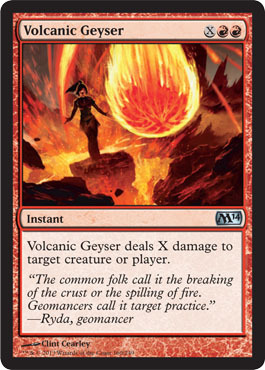 Aside from being a reasonable draft card, Volcanic Geyser is just an extremely poor man’s bonfire of the damned, fireball, you name it. The one saving grace it has is it’s ability to be played at instant speed, but this card isn’t going to be played so that’s completely irrelevant. The next Stoneforge Mystic. The Chosen One. The Red Messiah. Combomancer. Ok enough of that, while this card certainly gets the brainstorming going, I don’t know how good it is. There is a ton of hype both in the pro and casual community, but which deck it ends up with will be what determines if I personally am on the bandwagon or not. Young Pyromancer seems most suitable for combo, although there has been plenty of rumblings about this being a core staple in Red Deck Wins. I’m not sure if I want to make more guys only to have them get hit by a Supreme Verdict versus getting in there sooner with Burning-Trees, Ash Zealots, and Lightning Maulers. What he does provide though is incremental advantage, especially later in the game or against decks that don’t have access to a sweeper, and this can be very important. I could see this guy flood the board in the first few turns and then allow you to drop a Hellrider with plenty of backup. That said, you have to burn them to get the tokens, and I’m typically not casting my burn spells on turns 2 and 3. In Legacy and Modern this guy is probably insane, but Standard is my cup of tea. Overall, I feel like I’m misevaluating this card and that there is going to be someone who breaks him, I’m curious to hear others thoughts, so feel free to comment with your grandiose ideas. The biggest article so far on it that I’ve seen is Matt Nass’s (here). Awaken the Ancient has potential to be good, but at the moment I don’t think it’s going to make the cut in Red Deck Wins. Not having evasion is a big deal, especially for something that is essentially a 5cc spell. It’s bigger than anything Red Deck would normally play though and it requires instant speed removal, so these factors will probably push people to experiment. My biggest gripe is the turn it’s cast, which is usually the turn you should be killing them. Comparatively, the only thing that comes to mind is Elemental Appeal and that card was not only faster and better, but it saw limited play as well meaning it is going to be a big stretch for Awaken to ever wake up. Furthermore, I could never see this being better than Thundermaw Hellkite or Zealous Conscripts, so at the very least it will need to wait until rotation or be a narrow sideboard card. This card has me excited as a potential immediate sideboard option. 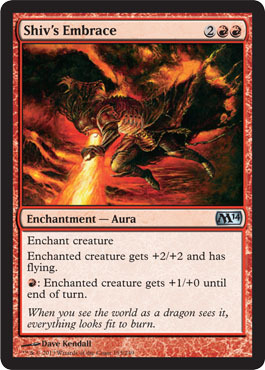 Manabarbs has been an extremely longtime staple of Red Deck Wins and in a world full of Shock and Buddy lands, Burning Earth is effectively the same. You have the drawback of them being able to use their basics, but those are few and far between these days for control and midrange, and this negative is offset by the fact that this clause doesn’t hurt you at all. 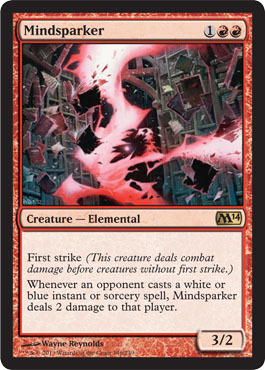 Unlike Manabarbs which could occasionally backfire on you, the Mono Red player rarely has a nonbasic in sight, so playing this card gives you a lot of turns you otherwise wouldn’t have had with Manabarbs. I’ve been struggling to find cards that I truly want to “bring in” against UWR, and a card like this is a perfect option. Playing this following a Supreme Verdict on the other side of the table basically means any spell they play puts them in lethal burn or Hellrider range. This should be a very played card in the next few months for Mono Red, if not post-rotation as well. It has a lot of competition at the 4cc slot, but given the history of this style of card, I can’t imagine it won’t get used. Chandra, Pyromaster is getting a lot of hype, and I think it’s deservedly so. I’ve done some brief playtesting with her in a few Mono Red builds and her presence on the board is very strong. 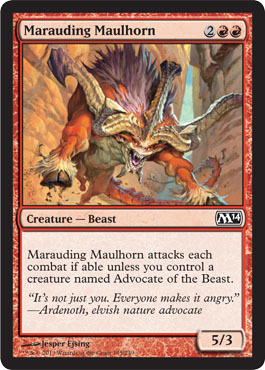 She gives red a draw engine that it hasn’t had before, and her +1 ability is deceiving because not only can it pick off small creatures but it can also keep planeswalkers in check and prevent large bodies like Thragtusk and Loxodon Smiter from blocking. The turn she comes down is fair, and her loyalty is high, so I expect this to get played immediately. It reminded me of a 1st place StarCityGames list (here) from a few years ago that utilized Koth in much the same fashion, except I think Chandra’s synergies with her Phoenix and the burn spells of the current format could be even more powerful depending on how the final builds come out. Her “-0” ability has been especially strong in testing, from doing crazy things like helping you to hit your 5th/6th land drop to simply being a Dark Confidant every turn. The only thing that will take some getting used to is the fact that the card is exiled and not just put into your hands, somewhat similar to how players had to adjust to using the Miracle mechanic. Take one scenario that I found interesting for example; Your opponent is playing Junk Aristocrats and they have a Sorin, Lord of Innistrad in play. You can +1 Chandra to kill their token and take Sorin down a loyalty, or you can kill the token and ping them to get your Phoenix back so that you can play it and attack. Lines like these are just fantastic, and one of the big reasons why I think she’ll get some action. She’s not a 4 of in any deck by any means, but I wouldn’t be surprised to see her as a 3 of alongside some Hellriders. 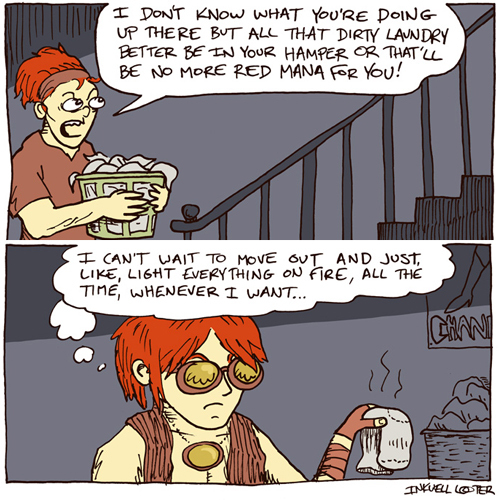 Koth might still be the best red planeswalker ever printed, but Chandra is borderline for proving that wrong. Personally, most of the games I’ve lost over the years with Mono Red were due to me running out of threats, and Chandra ensures that as long as she’s alive you’ll have plenty of gas coming your way. 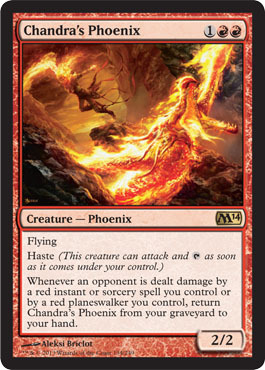 This takes us right into our next card, Chandra’s Phoenix. This was a hallmark staple of Mono Red when it was legal in M12, and it personally helped me as I piloted the deck to 15th place out of 225 at the Wisconsin State Championship that year. 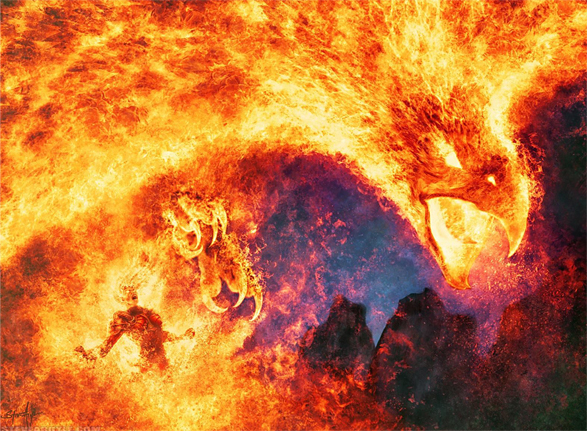 Chandra’s Phoenix is a deceivingly powerful card and it’s another one that I expect to see play even though it also has a ton of competition at the moment between Boros Reckoner and Pyreheart Wolf. If “Control” becomes a popular deck again, this is their worst nightmare. The buyback ability on Phoenix gets used heavily in this style of deck, and the evasion + haste at this mana cost is a very good rate. One of the gripes I’ve had playing Mono Red in the last year has been the lack of a hasty three drop with any beef behind it. There are some fringe cards that have it like Fervent Cathar, but his ability like any of the rest are too narrow to be good. 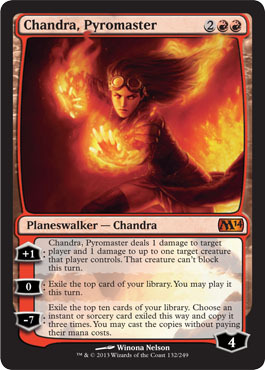 Chandra’s Phoenix will not only fly over most blockers in the format but it will probably come back at least once or twice in a long game and I’ve had quite a few games where it came back 4-5 times. And this is especially relevant when Supreme Verdict can be a back breaking card. Not only is there enough playable burn to support the Phoenix, but there’s also the new Chandra which is a fantastic followup on turn 4. The card might require Mono Red to change it’s list quite a bit, my current one for instance would have to really decide which three drop is best, so I’m going to have to do a lot of testing before I’m comfortable with how I put the final numbers. Not running Reckoner is a bit risky, but you could supplement it by having the value of Phoenix along with cards like Mutavault which is also strong against most of the common archetypes played. My immediate thought when I saw this card was that it was unplayable, then I hesitated and thought that maybe it could see fringe play as a 1 or 2 of. And THEN, I noticed that it was a rare, which intrigued me a bit because while there are plenty of junk rares in Magic there’s usually at least a little theory on the part of Wizards as to why this would represent a higher power level. The obvious interaction you’d want with him is in addition to being another grizzly bear, you could use him to setup that turn 5/6/7 where you force them to attack with their big beasts so that you can plow your guys through for the last bit of damage. 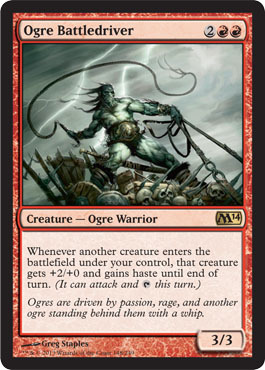 I think in an Eternal format he might actually be a bit more potent, as Goblins is a deck in both Legacy and Modern (very fringe) and you have a bit more tools to work with. In standard you’re basically just playing him as a trick, and he’s easily the worst of your two drops with what is currently available. I’m going to hold my breath on him for now until I have a chance to playtest a few sessions. I don’t think any other red card in the set has me more confused as to what to do with it then this one. For starters, overall I like the card. 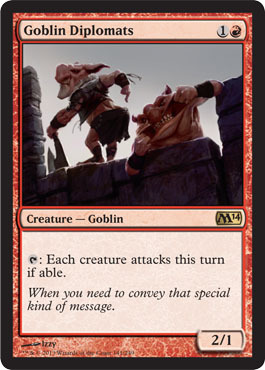 That said, it seems that it’s just one of those ones that Wizards printed so that red could have a token response to some of the BS white and blue cards they are printing. For instance, Public Enemy Number 1 and Public Enemy Number 2. Granted, his abilities are good just on their own, nobody hates having a 3/2 first striker in red for three mana who also happens to dome your opponent for two when they try to Azorious Charm, Think Twice, Supreme Verdict, or Sphinx’s Revelation. He’ll probably see some sideboard play simply because of that and aside from the fact that white got a gigantic slew of upgrades that just lifegain the hell out of a red deck. But at the end of the day, it’s another three drop in a clogged rotation spot of guys all previously mentioned in this post. I would find it hard to maindeck this guy and the sideboard space is already so narrow. He’s likely to become a metagame call, but it’s definitely a card I wouldn’t want to not have when I’m packing up singles for a tournament. 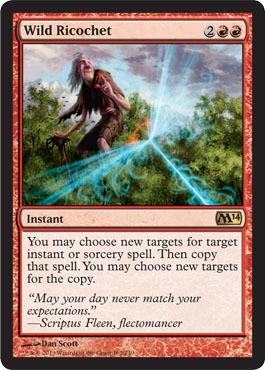 UW looks absolutely killer in M14, and if it takes off you will need a playset of this card. I’ve heard Ogre Battledriver being dubbed the “post-rotation-Hellrider” but this card is a gigantic step down from Hellrider. I would be surprised if this card sees play. 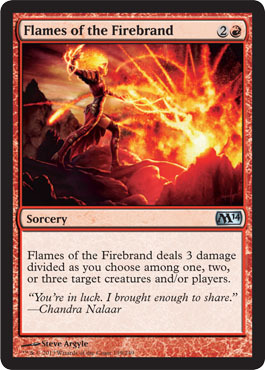 You already have Chandra at the four spot and this card is woefully behind Hellrider in what it gives you. It has to live a turn to be useful, you have to have another creature to gain value, that creature does not gain evasion, and he dies to any three damage burn spell. I’d have to see someone do something very clever with him to convince me he’s any good, for now count me out on this one. 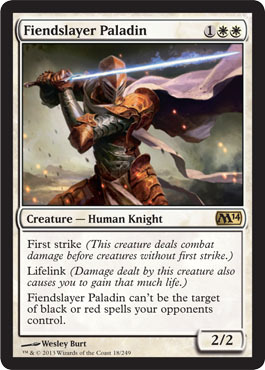 And I’m guessing Theros will have a little bit more mono-color focus then Ravnica (I mean how can it not), so I’d guess that somewhere in that block there will be a solid Mono Red four drop to oust this guy and slide in alongside Chandra. DRAGONS, BRARRR RAGGGE. In all seriousness this guy is kind of cool, and it’s obvious that Wizards is pushing dragons with this set. I’d be less surprised though if he’s more of an EDH card (if even that) than a standard card. And if he does get play it will likely be in a bigger red deck which doesn’t seem to have the tools to exist at the moment. 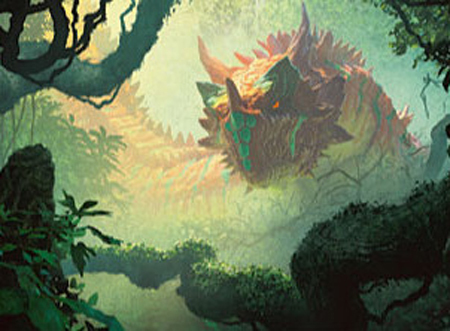 Maybe if Theros brings some dragons along with it this guy could shine, but they’d have to be Dragon Whelp 2.0 for me to see it happening. MOAR DRAGONS!! No hate, Shivan is the man. He almost assuredly won’t see any constructed play, but this guy reeks of classic Magic the Gathering. I remember the good old days of bringing my unsleeved monstrosities of Revised cards to the local shop in town and being overjoyed when I got a chance to jam this guy out and then pump up the volume. How can you hate on this guy, he’s an iconic Mono Red playa. It’s just a shame they didn’t keep the original art, but alas it’s Wizards. If someone plays this in a Standard deck that is even remotely tier 2, I will give them massive props. He’s the equivalent of playing Nicol Bolas, he’s just awesome. 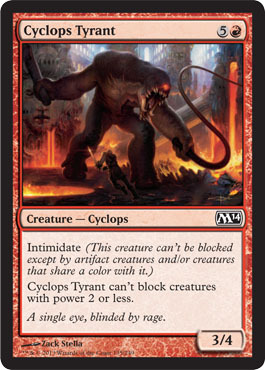 Not really much value for Mono Red, but this card should see heavy play in whatever Slivers deck arises. 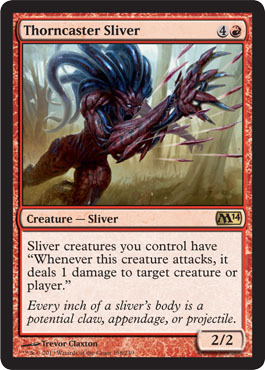 I think people are sleeping on Slivers. It was never quite Tier 1 the last time around, but it was very close and I had several friends that had excellent Slivers decks in Standard. They are a scary crew of monsters, and this time around they look like they have a lot of valuable tools to make them surprise some players. This guy is basically the Hellrider of the group, and at 5 mana he’s still very much the real deal. And who knows, maybe I’m completely off base and a semi-slivers Mono Red deck is out there, it’s just highly doubtful. A fine reprint from Lorwyn, while it’s not really a constructed card this is a blast in EDH, and anyone who’s familiar with the format has probably had this cast on them or cast one against someone else. This would also be a pretty hilarious card against a deck like Jund, turning their Rakdos Return, Bonfires, and Spot Removal into a laughing stock. Could be a fringe 1-2 of in sideboards, but doubtful.